We all know that green pools and spas pose health issues. But what many people are unaware of is the fact that even if a spa water is not green or discolored, it can pose a health risk to anyone in or near the spa. If the water in your spa is not properly balanced, the result can be a breeding ground for germs. 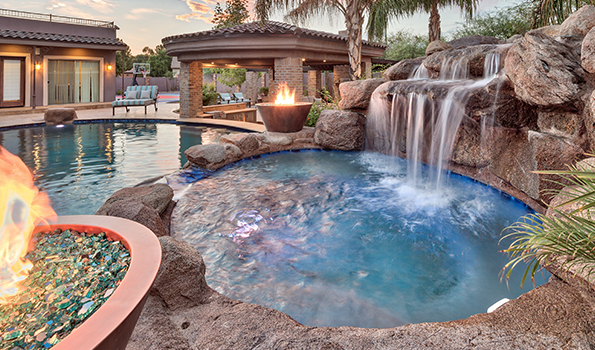 This is an issue for both pools and spas but the heated water in a spa can cause the germs and bacteria to multiply much more rapidly, creating a more dangerous environment. Because spas generate heat and mist, there is a far greater risk of respiratory infections for anyone in the spa or near it, if the water is not properly balanced. In well-balanced water, the chemicals prevent germs and bacteria, but if the water is not balanced then the chemicals will not function properly. The germ Legionella is one of the most common contaminants found in recreational water. When the water is ingested or the mist from the water is inhaled, the germ can cause a type of pneumonia called Legionnaires disease. In the United States, almost 20,000 people each year are admitted to hospitals to treat Legionnaires disease. Antibiotics are usually successful in treating the disease, but it can be fatal. Individuals who are over 50, smokers, people with chronic lung disease and those with a weakened immune system are all at a higher risk of becoming seriously ill when in contact with Legionella. The best way to avoid any risk of illness as a result of bacteria or germs in your spa is to regularly test the water for adequate free chlorine or bromine as well as the pH level. If you find that any of these results are not within the acceptable level, do not use the spa until the water chemistry has been corrected and the levels are all reading within the safe range.